Many of these plate types are based on information sent by the DPW. Some of these plates are not verified to exist, and some, by the department's own statistics, have never actually had any issued! Please let me know if you own or have seen any of the missing plate types. Years issued: 1964? to 2004? Available as: Duplicate (first issued 1993), Non-Resident (first issued 1987), Duplicate Non-Resident (first issued 1993); These plates are unverified and may use the same plates. Years issued: 1959? - 1963? Old "combo" plate discovered by Rod Hemmick. First Year of issue: ???? Available as: Duplicate (first issued 1993), Non-Resident (first issued 1991), Duplicate Non-Resident (first issued 1993); These plates are unverified and may use the same plates. Available as: Duplicate (first issued 1993), Non-Resident (first issued 1989), Duplicate Non-Resident (first issued 1993); These plates are unverified and may use the same plates. Available as: Non-Resident (first issued 1997). These plates are unverified and may use the same plates. 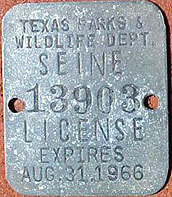 Available as: Duplicate (first issued 2000), Non-Resident (first issued 1979), Duplicate Non-Resident (first issued 2000); These plates are unverified and may use the same plates.